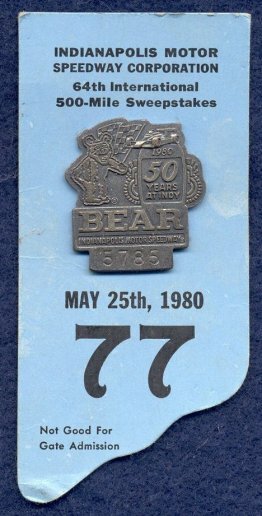 The Bear Alignment badge in 1980 marks the last year for product or service badges. The badge measures 1 1/4" x 1 1/3" 1980, '81 and '82 have NO Bastian Bros. name or logo on the back. 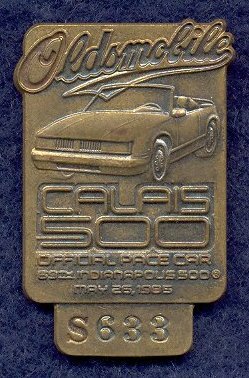 1981 begins an eighteen year run of Pace Car badges where the name or the logo of the pace car maker are represented on the badge. For 1981, the Buick Regal Turbo was the pace car. The badge measures 1 1/4" x 1 1/3". For 1982 the Chevrolet bow-tie and checkered flag appear and the pace car was the Camaro. The '82 badge comes in at 1 2/5" x 3/4". 1983 was the Buick Riviera. The '83 measures 1 1/8" x 1 1/8". The silver is still in the original plastic bag. The 1984 badge is the Pontiac Fiero and it measures 1 1/16" x 1 2/5". 1985 is the Oldsmobile Calais and it measures 1 3/5" x 1 1/16". 1985 bronze badges have a problem on the back with cracks around where the number area attaches to the badge. The 1986 badge is the Chevrolet Corvette and it measures 3/4" x 1 3/4". 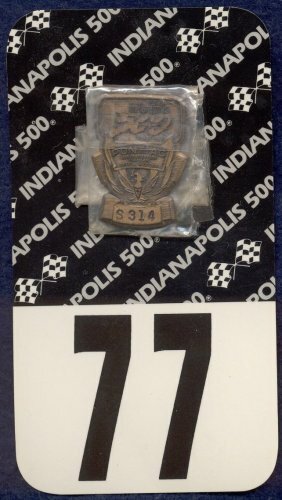 The Herff Jones Co. took over badge production marking an end to the Bastian Brothers Co. thirty nine year run as the Speedways pit badge maker. The Chrysler Le Baron was the pace car for 1987 and the badge comes in at 1 x 1 3/4". 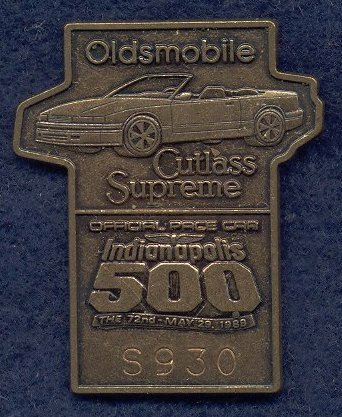 1988 saw the Oldsmobile Cutlass Supreme as the pace car. At 1 3/4" x 1 1/2", the '88 is the largest of the 80's badges. 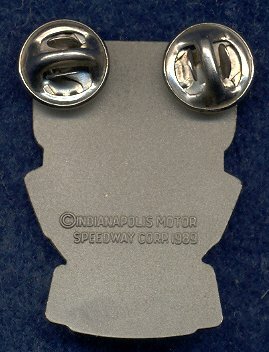 In 1989, the Indianapolis Motor Speedway Corp. took over the manufacture pit badges from Herff Jones. 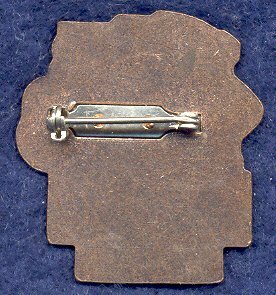 Also in 1989, the clasp and pin disappears and a two pin system replaces it. 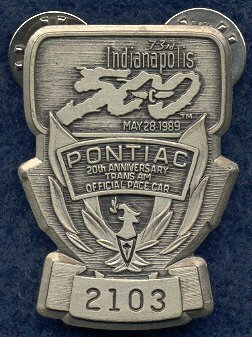 The 1989 pace car was the Pontiac Trans-Am and the badge measures 1 1/16" x 1 1/2". The date is also on the back and will remain so through today. This marks the first time since 1947 a date has been on the back. Because more badges were being produced during the 1980’s, badges from this era are all fairly easy to come by. If one had to choose, the 1984, '86 and '89 could be considered the toughest of the 80's due to the pace car from those years.